It's time for a The Simpsons trivia quiz! What, according to Ned Flanders, is the answer to the question no one asked, and what episode is the line from? I will answer at the end of the commentary, so you have until you finish reading this to remember (or Google it). This particular storyline has been in the back of my mind for a long time now, and this comic pretty much sums up the primary reason it could be considered a bad idea. For a while. 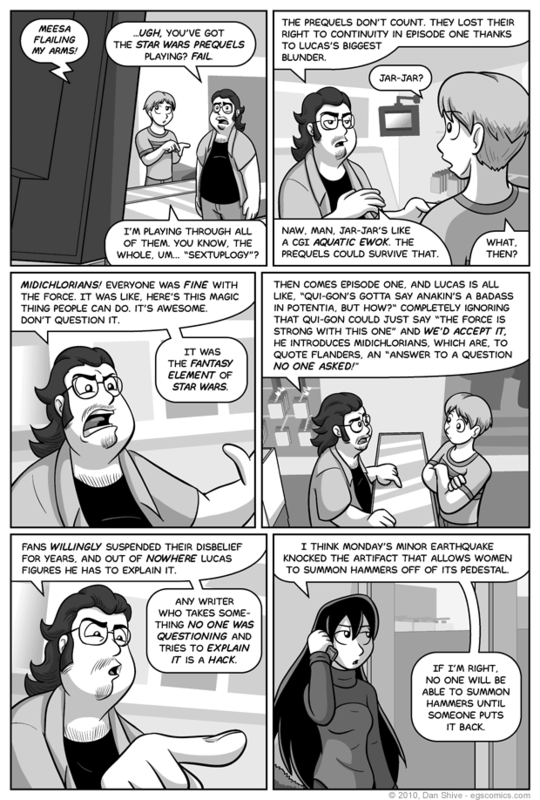 breaking the fourth wall, commenting on the Star Wars movie prequels and the meta humor thereof was the only reason for this storyline to exist. But then, a funny thing happened. I got another idea for why it should exist. Then another. And another. I eventually found myself with a bunch of reasons to do this storyline and only one reason not to, the reason not to being pretty much summed up in this comic. While the hammers had effectively become a huge plot hole, I doubt anyone cared. I haven't gotten any e-mails demanding answers about where they came from, how they work within the established magic system, etc. To quote the fourth panel, it is an answer to a question no one asked, so it's a good thing my motivations for doing this story aren't ultimately explaining the origin of the hammers. As for this secondary character, he wasn't supposed to resemble me, but once I shaded him he looked sort of like a larger, rounder and hairier version of myself (who ironically has less facial hair than me). He was supposed to look like an amalgam a various people I know who aren't me, so it's a bit weird to say the least. You can read a more about him in his sketchbook entry debut. And now for the answer to my Simpsons trivia question! The "answer to a question no one asked" was Lisa Simpson, and the episode was Hurricane Neddy.